Four New Jersey communities will join 36 other groups from around the country in Denver on October 17th and 18th, as part of a White House-backed national campaign to reimagine how to deliver Science, Technology, Engineering and Math (STEM) subjects to pre-K to 12th grade students, through partnerships with industry, museums, afterschool providers, universities and parents. “We are proud to sponsor New Jersey’s delegation so we can learn what’s going on around the nation, bring it home and make it work here,” said Laura Overdeck, Founder and President of Bedtime Math, Chair of the Overdeck Family Foundation and volunteer Chair of the STEM Pathways Network ( https://njstemecosystems.org/ ). Two representatives from each New Jersey community will attend the Communities of Practice meetings in Denver on October 17 and 18. The New Jersey STEM Pathways Network chose four communities to work with a national organization that will show them how to provide the STEM education and experiences students need to succeed in college, career, and life. The selected communities are from Delran, Hudson County, Newark and a coalition of counties representing South Jersey. The NJ STEM Pathways Network started in 2014, when Secretary of Higher Education Rochelle Hendricks brought together a group of educators, entrepreneurs and industry leaders to suggest ways to improve pre-K to 12 STEM education in the Garden State. The selected communities will work with the Teaching Institute for Excellence in STEM (TIES), a growing national organization which already manages 36 other STEM projects to benefit children in areas around the nation as diverse as California, Ohio, and North Carolina. TIES received a $300,000 grant from the Overdeck Family Foundation to get the New Jersey project off the ground. Key to the idea is that each “community” is an integrated ecosystem, where schools, colleges, businesses and educators work together with students and parents to prepare for the STEM jobs that will drive the economy in the future. New Jersey Secretary of Higher Education Rochelle Hendricks praised Overdeck’s leadership of the Network and emphasized the value of having a national group guide the campaign. Labor forecasts predict more than 200,000 New Jersey jobs in STEM fields must be filled by 2025. To begin to meet the need, the New Jersey STEM Pathways Network chose four communities that will find new ways to provide the STEM education and experiences students will need to be successful in today’s competitive environment. The photographs below were taken during a Sept. 29 ceremony at the Mercer County Community College Conference Center when the communities were announced publicly for the first time. Descriptions of the communities and their projects follow. 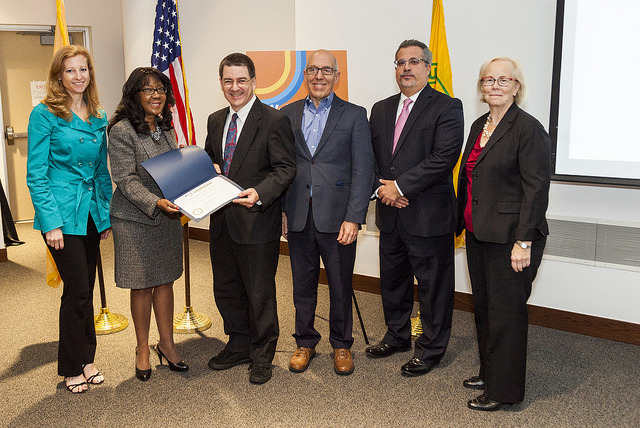 The Delran STEM Ecosystem Alliance will assist students to graduate with STEM knowledge, skills and applied learning capabilities necessary for success in STEM college education and careers. 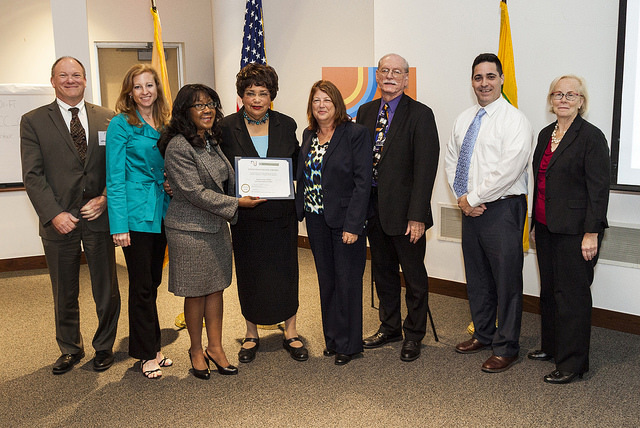 Aligned with the mission of the New Jersey Department of Education, the Alliance will service 3,000 students in Delran, Burlington County by preparing them to achieve proficiency in STEM fields (particularly women, people of color & special needs populations) while supporting educators who teach STEM subjects to ensure they have access to the resources they need. (Left to right) Kari McGann (Delran Township Public Schools), Amy Yodis (Delran Township Public Schools), Dr. Edem Tetteh (Rowan College at Burlington County College), John Radwell (Radwell International, Inc.), Allan Croly (Lockheed Martin), Mayor Ken Paris (Delran Township), Dr. Brian Brotschul (Superintendent of Delran Township Public Schools), Mary Jo Hutchinson (Delran Township Public Schools), Joseph Billick (Delran Township Board of Education), Erica DeMichele (Delran Township Public Schools), Lisa Gleason (PSE&G), Marybeth Montgomery (Barnes & Noble-Moorestown), Aubrey Paris (Princeton University Department of Chemistry), Allison Hunt (Perkins Center for the Arts). The Liberty Science Center will serve as the lead agency for the Liberty STEM Alliance. Located in Jersey City, a major urban center with a population of more than 260,000 people, the Alliance will serve as the central information hub to increase knowledge of and participation in STEM services available to youth, adults, educators and families throughout the Hudson County area. Partners include: Liberty Science Center, Jersey City Public Schools, Stevens Institute of Technology, Johnson and Johnson, and Fidelity Investments. (Left to right) Laura Overdeck, Founder and President of Bedtime Math, Chair of the Overdeck Family Foundation and volunteer Chair of the STEM Pathways Network; NJ Secretary of Higher Education Rochelle Hendricks; Patrick McQuillan, Liberty Science Center's Vice President of STEM Education; Arthur Camins, Stevens Institute of Technology, Director of the Center for Innovation in Engineering & Science Education (CIESE); Anthony Bisulca, LSC's Associate Director of Teacher Programs and Jan Morrison, President and CEO of the Teaching Institute for Excellence in STEM (TIES). The Newark STEAM Coalition will create a resource-rich ecosystem to prepare Newark students pre-K to 16, and the Essex County community to fully participate in a 21st Century STEAM (Science, Technology, Engineering, Arts, and Mathematics) workforce. The Coalition’s goal is to develop Newark’s future STEAM workforce by closing education, access and opportunity gaps through collaborations among businesses, institutions of higher education, school district leadership, youth service providers, science and cultural institutions, and workforce development agencies. We aim to align STEAM education with New Jersey’s projected economic growth. Partners include: The City of Newark, Newark Public Schools, Students 2 Science, The Newark Museum, Afterschool Allstars Newark, New Jersey Institute of Technology, Rutgers University-Newark, The Victoria Foundation, The Prudential Foundation, The PSEG Foundation, Newark Arts Education Roundtable, NJSACC: The Statewide Network for New Jersey’s Afterschool Communities, and Newark Thrives! 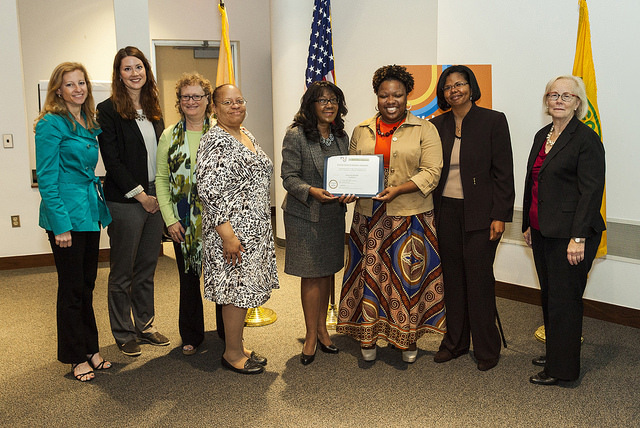 (Left to right) Laura Overdeck, Founder and President of Bedtime Math, Chair of the Overdeck Family Foundation and volunteer Chair of the STEM Pathways Network; Lisa Gleason, PSEG Foundation; Wendy Liscow, Geraldine R. Dodge Foundation; Levelle Burr-Alexander, New Jersey Institute of Technology; Rochelle Hendricks, NJ Secretary of Higher Education; Traymanesha Moore, Newark Thrives! ; Dale Anglin, the Victoria Foundation; and Jan Morrison, President and CEO of the Teaching Institute for Excellence in STEM (TIES). 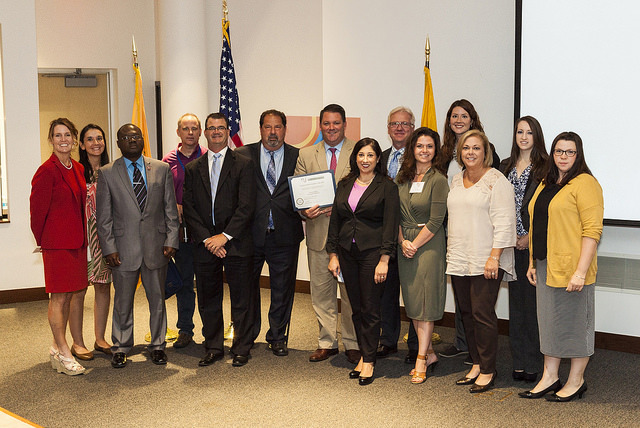 The South Jersey STEM and Innovation Center at the Educational Information & Resource Center (EIRC) seeks to convene its large network of partners to improve STEM program delivery in public education while committing to an innovative approach developed by Stanford University’s “Collective Impact” model. Focusing on community engagement, the Center will initially serve 85,000 families across Camden, Salem and Cumberland counties, with potential expansion into Gloucester, Atlantic, Burlington, Ocean and Cape May counties. Partners include: Educational Information & Resource Center (EIRC), Salem County Learning Partnership, Salem Community College, Camden County College, Camden Dream Center, STEMJOBS, MakerBot, and Camden County Technical Schools. Experts include: Allison Jackson Associates, NJ Center for Teaching and Learning, NJ Network to Close the Achievement Gaps, University of Pennsylvania, Global Connections, EIRC, MacEwan Consulting, MentorNet and GreatMindsinSTEM, Mid-Atlantic States Career Education Center, Statewide Parent Advocacy Network –NJ, Camden County NAACP, IBM Corporation, Camden County Workforce Investment Board, Liberty Science Center, Department of Labor and Workforce Development (Workforce Data Analysis Unit/ Talent Networks), Rutgers University, Center for Science, Mathematics & Computer Science, NJ Technology and Engineering Association, IEEE, electrical engineering, InnovationNJ, New Jersey Business & Industry Association, DiscoverE, Future Cities. (Left to right) Jeffrey Stoller, Assistant Commissioner, NJ Department of Labor and Workforce Development; Laura Overdeck, Founder and President of Bedtime Math, Chair of the Overdeck Family Foundation and volunteer Chair of the STEM Pathways Network; Rochelle Hendricks, NJ Secretary of Higher Education, Dr. Allison Jackson, President, Allison Jackson Associates; Patricia Bruder, EIRC, Consultant, Grants & Special Projects; Dr. Raymond Bolden, Fund Development Specialist, Mid-Atlantic States Career Education Center; Michael MacEwan, President, MacEwan Consulting, and Jan Morrison, President and CEO of the Teaching Institute for Excellence in STEM (TIES).